One of my former drummers got me into this band years ago but I’ve never thought of using their music during gaming. A request was made to review the band and since I own a couple of their cds I figured I would. Explosions in the sky is an instrumental “post-rock” band. 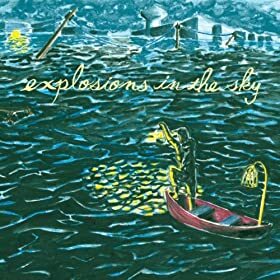 Their music alternates between spacey textures reminiscent of 70’s experimental rock bands like Pink Floyd and booming crashes that reveal why they are called “Explosions in the Sky”. The sonic landscapes they produce carry you gently down the river and then suddenly over a waterfall. All of a Sudden I Miss Everyone is another great release, but again I find it difficult to imagine using as background music. The only track that I can imagine giving a try would be “What Do You Go Home To?” because it lacks the dramatic shift to heavy rock and machine gun-like snare work. “So Long Lonesome” could be a possible candidate, though the introduction of drums at the end makes me a little skeptical. To reiterate what I said about Those Who Tell the Truth, this could be great music for a descriptive scene though. One could use the cues for dramatic changes in the unfolding events you are narrating.